On loading docks at the back of a big retail a store, you will see quite a few large recycling hoppers. One will be for plastic, another for metal, another for glass, one for paper and still another for organic material. during the work day, warehouse employees will unpack boxes of product for show inside store. Cardboard boxes will be broken down and stored someplace temporarily. The bubble wrap, foam peanuts and other plastic recyclables need to be stored in a bin before being moved out to the bin designated for plastics. The most resourceful way to store, move and take away all of this plastic material is by having a forklift attached to a self dumping hopper on the warehouse floor. After the forklift worker dumps the plastics, he can come back to the warehouse and toss the cardboard into the recycling hopper and take that out to the paper recycling bin. In any industrialized location, the machining of materials results large amounts of metal scraps. A lathe or saw produces tiny particles of waste in huge amounts. Optional feeding chutes attached to low profile self dumping hoppers direct all that metal shavings into the hopper designated for metal. When hopper is full, the forklift worker can take it to the larger outdoor container quickly & safely. Self dumping hoppers are very useful on construction jobs, where wood chips, steel shaving, empty cement bags and other debris that collects quickly. Clearing the work area of scraps, and other recyclable material becomes easy when utilizing a recycling hopper. In Addition our hoppers have casters attached that allow, it to be rolled from place to place, making cleanup that easier. Food service companies produces large amounts of organic recyclable waste. Lidded (Lids Sold Separately) steel self dumping hoppers are ideal for the storage of organically produced waste. Seamless and watertight, there is no leakage and the lid takes care of foul odors. After the hopper is dumped, it can simply be washed out with a hose. 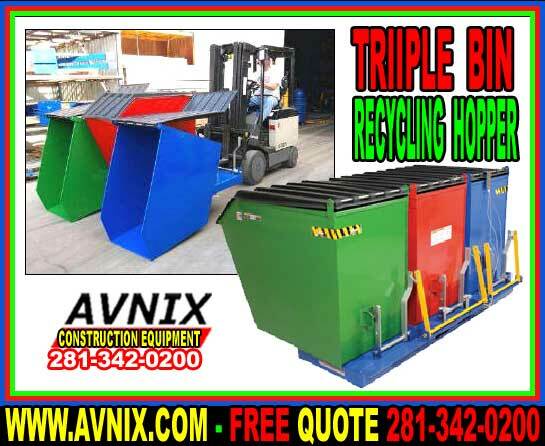 Avnix recycling hoppers have a safely latch applied when in the upright position, but are easily dumped when full, there is no better container for recycled material. They are also perfect for those times when big volumes of small replacement parts or tools make transport with a forklift impractical or impossible. 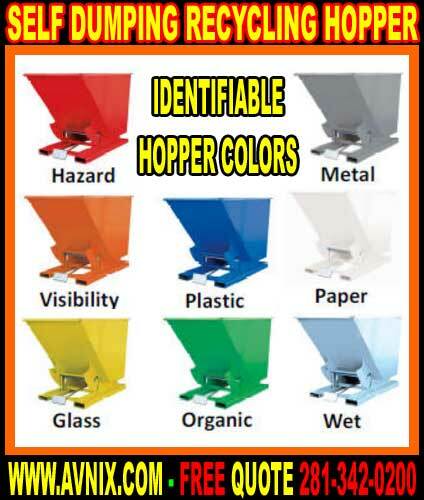 Self dumping hoppers are not only inexpensive and adaptable, they are necessary in any commercial setting.